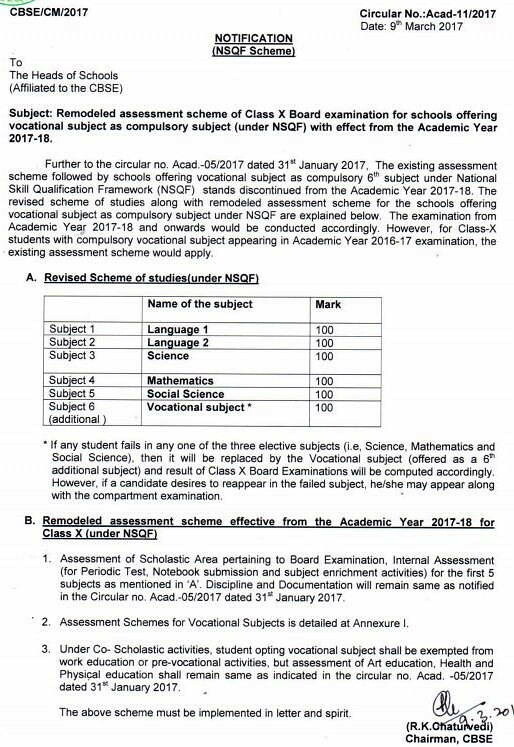 CBSE makes Vocational Subject Compulsory for Class 10, As per the official notification published on 9 March 2017 - there will be now 6 Subjects for the class 10 students which includes the vocational subject. The class 10 students will have to study compulsory 6 subjects, and the final assessment of the 2017-18 candidates will be based on the scores of the 6 subjects. The 6th subjected is included (compulsory) under the National Skill Qualification Framework(NSQF). Till 2017, class 10 students have to study five subjects which are two language subjects, science, mathematics and social science. Class 10 students also have a choice of studying a vocational subject as an “additional” subject. However, it will be compulsory from 2018 onwards for the students to study a vocational subject not as an additional but a compulsory subject. The CBSE is working for remodelling its assessment scheme so every student of class 10 will have to study 6 subjects from the next year. The CBSE has acknowledged all the heads of the schools (Affiliated to the CBSE) in India about the new change for class 10 students. The Central Board of Secondary Education (CBSE) has remodelled its assessment scheme for class 10 board examination. The Central Board of Secondary Education (CBSE) has made a big changing in its assessment scheme for Class 10 Board examination for schools. Under the National Skills Qualifications Framework (NSQF), a vocational subject who is now an optional subject will be a compulsory subject from the next academic year 2017-18. “If a candidate fails to pass in any one of the three elective subjects — science, social science, mathematics, then it will be replaced by the vocational subject (offered as sixth additional subject),” a CBSE circular said. “The board exam result will be computed accordingly, however, if a candidate desires to reappear for the failed subject they can appear in the compartment examination,” it added. Now the students will have 13 options to choose as the sixth subject and the name of all 13 subjects are given below. The total weightage of the Vocational Subject will be of 100 Marks. Out of which there will be a board exam of 50 Marks and the rest 50 Marks for practical which will be conducted by the school itself (Internal Assessment). Students have to secure the minimum of 33% marks in both (Board Exam and Practical Exam) individually to pass. For any queries related to this News, Please write to us in the comments section below.